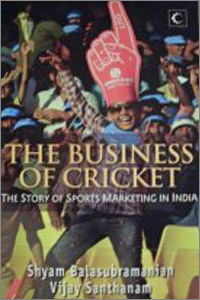 At the time of this book's publication, India was the number one team in the world and therefore it was the ideal time to produce a book of this nature which charts how cricket - and other sports - has become such a big business for companies. India made a slow start to international cricket in general and it is accepted that the first Indian cricketer to truly become the first marketed cricketer was the legendary Sunil Gavaskar with Palmolive. The next was Kapil Dev followed by Sachin Tendulkar whilst now any number are offered opportunities with large companies. The two authors, with considerable experience as sports marketers, have produced a very readable book with plenty of facts and figures showing how important predominantly cricket became to big businesses and how cricket took over from another major sport, hockey. I was impressed how the authors qualified their comments with, on the whole, the words in their opinion/estimation, and, for anyone interested in a book generally about cricket off the field this is a useful addition to any cricket lover's library. There is a section on what leading cricketers must do their best to avoid if they want to continue being ambassadors for companies: match fixing, injuries, embarrassing tabloid revelations, substance abuse, political or religious controversy, poor performance and disreputable behaviour. It cannot be easy being an Indian cricketer and, in my opinion, many Indian players carry it off magnificently. How the IPL benefit many people is also discussed and the authors end with suggestions on how the BCCI can improve in certain areas and, from a certain amount of experience of watching cricket in India, I warmly agree with some of those points in this eminently readable and interesting book.